Separated at birth, bonded by blood: Willy Russell’s tale of two young twins who grow up on opposite sides of the tracks but eventually meet again with fateful consequences has become an enduring tale, constantly moving audiences. The musical version of the play has gained great acclaim, with songs like ‘Bright New Day,’ ‘Marilyn Monroe’ and ‘Tell Me It’s Not True’ living long in the memory. This week it begins a short run at the Theatre Royal, which lasts until 18th March. Make sure you catch this modern classic before it’s gone. 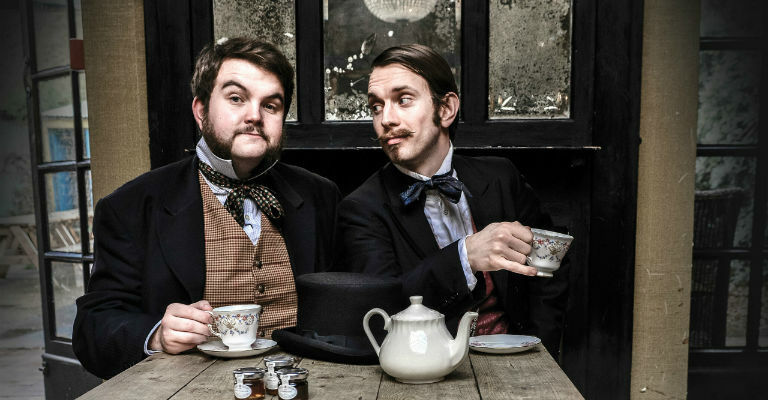 Step right up and bear witness to the magnificent, mind-boggling and all-round spellbinding magic of that rambunctious duo Morgan and West! Continuing their highly successful tour, the pair are headed to Hexham to offer up more of their ridiculously entrancing feats. These dashing chaps are no strangers to the world of illusion and impossibility, all served up with a slice of wit and charm on the side. With no small amount of panache, they’re set to blow your mind, so make sure you wear a hat – it might be the only thing keeping your brain from bursting! The illustrations of Quentin Blake are some of the most recognisable and distinctive around, thanks to their simple but cartoonish style and use of colour. Now an exhibition of Blake’s work is on display at the Laing Art Gallery until 8th July, celebrating the illustrator’s genius. The collection, which comes from the House of Illustration, gives an insight into the origins of some of Blake’s most unique and memorable creations, from his works on Roald Dahl’s classic books to his more recent art for David Walliams’ ‘The Boy In The Dress.’ Examining his very specific techniques and inspirations, and bringing together more than 100 pieces of original art, ‘Inside Stories’ is an exhibition that no art or book lover will want to miss out on. Two Norwegian artists and specialists in printwork, sisters Annette and Caroline Kierulf, are being brought together by Northern Print this month for a special collaborative exhibition. The pair have agreed a framework for their prints, have decided to use the format of posters but have created very individual artworks. Both using one of the oldest forms of printmaking, the pair have put their own spins on aspects of modern life, including technology, the economy, consumerism in general and the environment. Originally shown as part of the International Print Biennale last year, this is another chance to catch this fascinating exhibition alongside additional prints by the highly talented Kierulf sisters. Are you or someone you know a big fan of Michael Bublé? Well close your eyes at this event and you probably won’t believe that the man himself isn’t on stage! One of the UK’s best tributes to everyone’s favourite modern crooner is headed to Wynyard Hall for a special night of entertainment that’s sure to swing. But Bublé isn’t the only attraction here: there’s also a delicious 2-course meal included that’s sure to make your mouth water, and a bar open until midnight. If you’re looking to make your Friday night just that little more special, Wynyard Hall are making that possible. National Dance Company Wales are bringing not one but two works from a pair of innovative choreographers to Dance City on Saturday and Sunday. In ‘Profundis,’ Roy Assaf has crafted a thoughtful celebration of movement, while in ‘The Green Room,’ NDCW’s Artistic Director Caroline Finn is blurring the lines between reality and fantasy through a twisted yet nostalgic journey into a TV world. On Saturday, there’s also a post-performance discussion which will shine a light on the works and provide a fascinating insight into what the company intended with their performances. Sunday nights can be a bit of a drag, with the threat of Monday morning looming ever nearer. But why not alleviate the doom and gloom a bit by seeing one of the country’s fastest rising stand-ups in action? Iain Stirling has been on tour around the country (and the region) with his latest show ‘Onwards!’ and comes to The Stand on Sunday, where he’ll be exploring what people think about his own generation within today’s society, as well as looking about their function within it. Still sounding a bit heavy? Don’t worry, Iain will have you in stitches in no time, and he’ll do it with a perceptive, satirical eye.